OLD and OA. 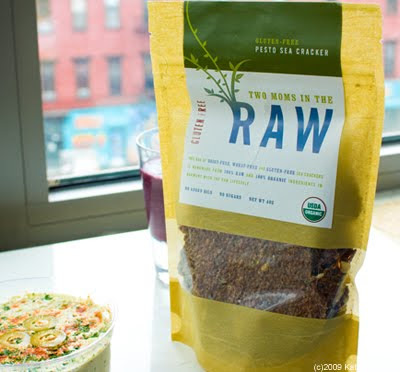 Two of my favorite raw snack retailers are in NYC: One Lucky Duck, part of the raw foodie restaurant Pure Food and Wine. 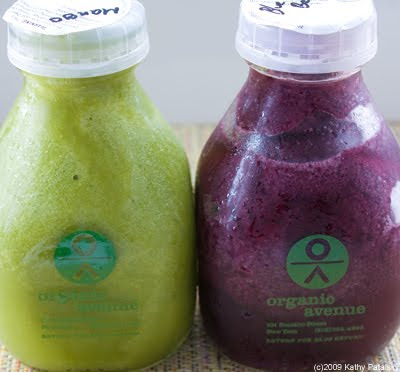 And Organic Avenue, a raw foodie haven on the lower east side. 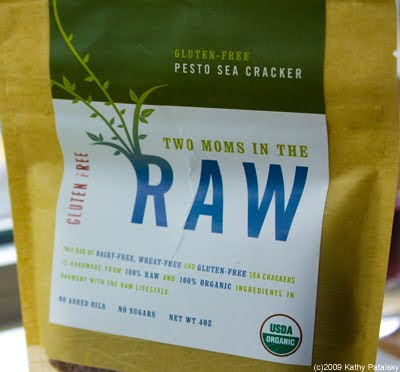 Both retailers provide cravable and ravable fresh raw eats (food and juices) daily, but they also have several packaged raw snacks on hand as well. And guess what, most of their packaged snack products are available for shipment to your doorstep. OLD has an awesome snack sampler pack filled with assorted raw treats and goodies. (click the 'snacks' image to enter OLD online store.) 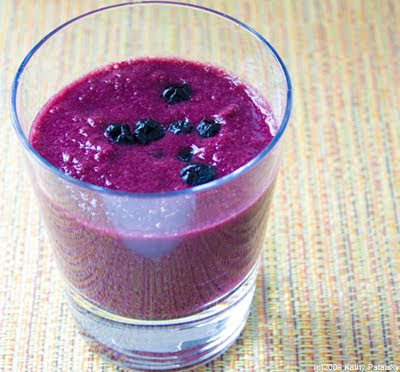 A must for anyone starting to experiment with raw snacks. Click here and you'll get a Free Snack Sample with your OLD order. See my review of One Lucky Duck's Cheese-y Quackers here. 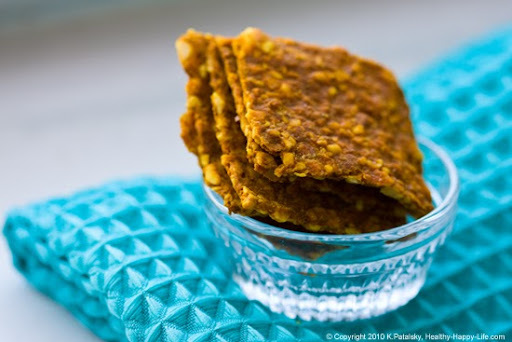 They are better than any cheese crackers you will ever try! Why Raw? 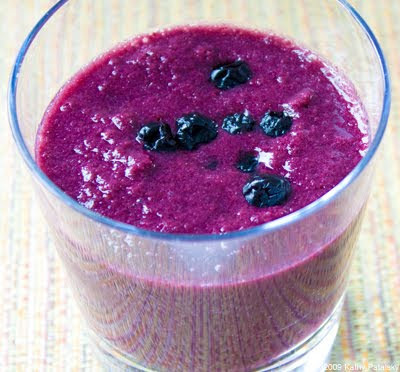 Whenever I'm looking to 'detox' my body or toxins and get back on track with my diet, I'll reach for raw foods. Raw foods provide optimal nutrition and since most of the food enzymes are still in tact, your body will be able to break down and take in the nutrients faster. Shelf Appeal: Adorable high quality resealable bag. 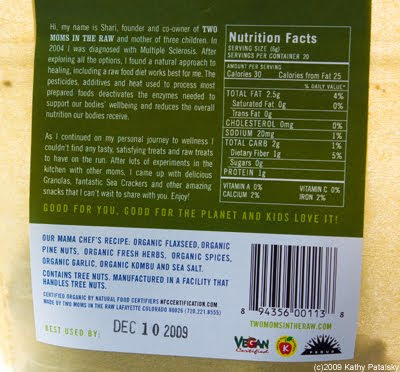 Love the vegan certified, kosher, natural food certified and Colorado product logos on the label. Clearly states that the product is gluten-free with no added sugars or oils. Great label signage. Honestly, when I saw the product in the baggie window, I was scared. I've had a few bad flax seed chips in my day ans this one looked super grainy. But I decided to give it a shot anyways...glad I did!. Label Check: In a 6 gram serving there are 30 calories, 2.5 grams of unsaturated fat, 1 gram of protein and 2 carbs. 1 gram of fiber and 20 mg sodium. 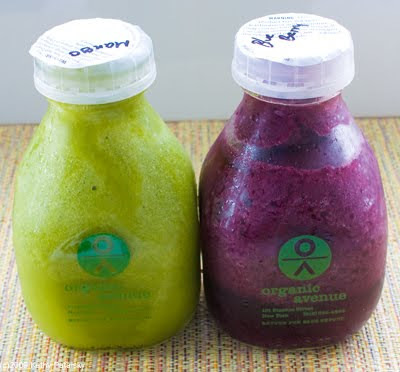 The product is vegan, gluten free, kosher, organic, raw, dairy-free and wheat-free. 20 servings per bag. Although I must admit I finished the bag in about 4 separate 'servings' for myself. So in each hefty serving I had there were about 150 calories. Nothing but good stuff in here: organic flax seeds, pine nuts, herbs, spices, garlic, kombu and sea salt. 40% RDA of iron per 600 total-calories bag. Healthy? yes. Taste Test: I was scared. Lots of flaxseeds, and I've had bad flax chips before. But OMG these were off the board delicious. Light, crispy, flavorful, salty, nutty and the pesto flavor was boldly divine. I handed one cracker to my seed-fearful husband and he groaned in dis-belief of the yummy taste. He stuck his hand out for more. Even he LOVED them, and I realized I was going to have to share this bag with him. I can't wait to try the other flavors: garden herb and tomato basil. Price Check: I bought my bag for $11.95. I know, I know. It's a little nutso expensive, if you compare it to the $1.95 bag of potato chips you're used to buying. But I was dying to try this specialty product and thus was happy to pay the twelve bucks to do so. My later online price research showed me that you can buy these sea crackers for $7 a bag on the TMITR website. yes! 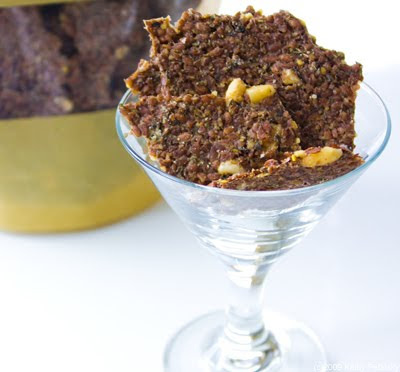 Last Word: If you think you know 'raw snacks' and haven't tried these, you have NO IDEA what you are missing. 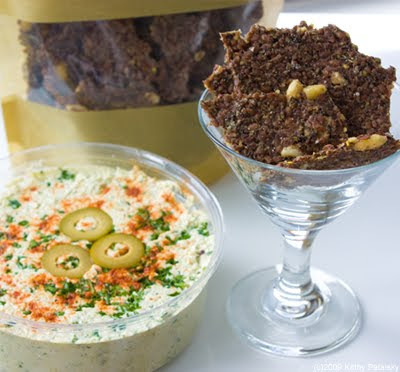 Dip them in some raw hummus and look at you, you're a regular raw foodie-loving every bite of it!! 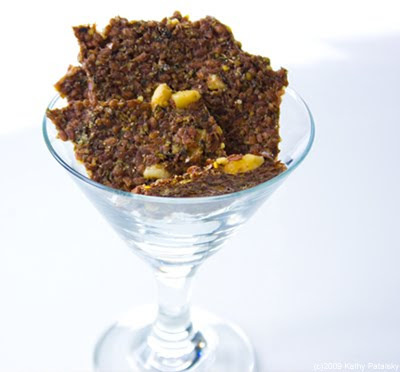 ...Read about One Lucky Duck's famous Raw Mallomar dessert: enter raw vegan bliss.